Please contact support for pricing information on larger orders. The scopist/proofreader/teacher/student price reflects a 10 percent discount off the reporter price. 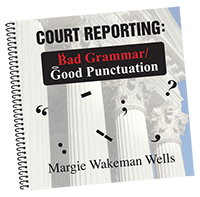 Court Reporting: Bad Grammar/Good Punctuation is the story of punctuation. 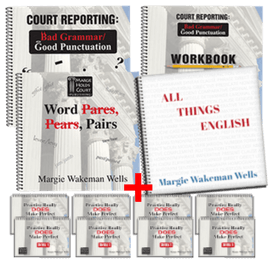 Read in its entirety along with the exercises that parallel it in the Workbook, this is an advanced course in punctuation for the court reporter, the court reporting instructor, the court reporting student, or anyone who wants to truly understand punctuation. 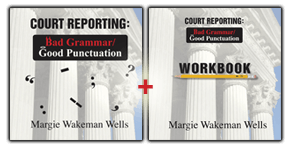 It is the definitive text on the rules for punctuation; a discussion/explanation of the rules; and the thing that sets it apart from other texts on punctuation is that it includes those special things we need to know about applying the rules to the court reporting transcript. English punctuation rules were developed for the written word: publications, reports, letters, term papers. They were not written for the spoken word with all its idiosyncrasies and anomalies — thus the need for a text that covers these. 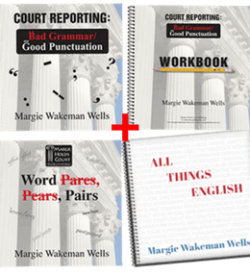 Because English grammar and sentence structure dictate the nature of the punctuation rules, there are some chapters included on some of the basics of grammar and most especially sentence structure. Things like number form, hyphens, and apostrophes have their own chapters as do appositives and parentheticals. Some words that need special consideration and where not to put punctuation have their own chapters. Shipping and handling will be added to each order. California residents must add 10 percent sales tax. These printed prices are guaranteed.